What hides in the forests and waters of Costa Rica? When travelling to Costa Rica you are most certain to meet some species of exotic animals, even if you are looking or not. Either if you are looking to scuba dive in Caño Island, or look at the the monkeys and sloths at Osa peninsula, this country will certainly tickle your senses. Costa Rica is home to more than 500,000 species which represents about 4% of the world’s species. This makes this little country one of the most biodiverse countries in the world. Here are 5 different animals that live here and that you can´t miss in your Costa Rica travel. 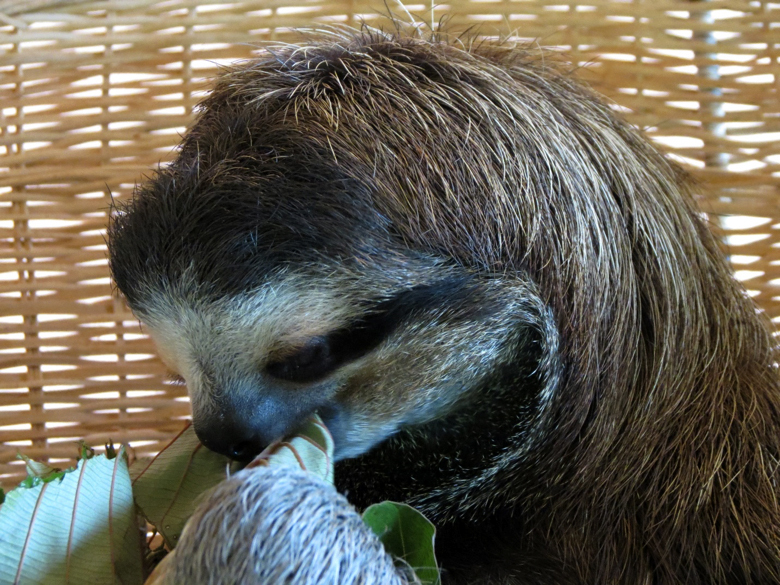 There are two types of Sloths in Costa Rica which is the brown throated three-toed Sloth and the two toed Sloth. The main difference on these two is obviously the toes, but there are also other differences. The three-toed Sloth has black eyes: these are the Sloths that has a “smiling mouth”. These are also a bit smaller than the two-toed Sloth which has white ringed faces and brown snouts. Their pelt is also a bit more ragged than the three-toed Sloths. The Sloths can be found all over Costa Rica but there are some places which will almost guarantee you to get a glimpse of these unique creatures, like the Osa Peninsula, Tortuguero or Manuel Antonio. Toucans are one of the most known birds of Costa Rica. There are six different types of Toucans that can be found throughout the country, mostly in the Pacific and the Caribbean lowlands. 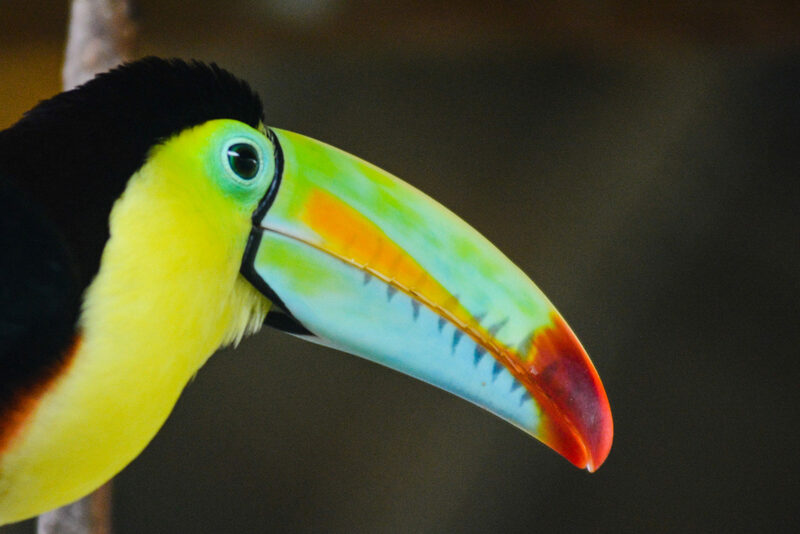 The different species of Toucans are: the keel-billed, chestnut-mandibled, emerald toucanet, yellow-eared toucanet, collared aracari and the fiery-billed aracari. Toucans are very important for the rainforest because of their ability to spread seeds. These birds are a must when you travel to Costa Rica, even though one of them is the national bird of Belize! 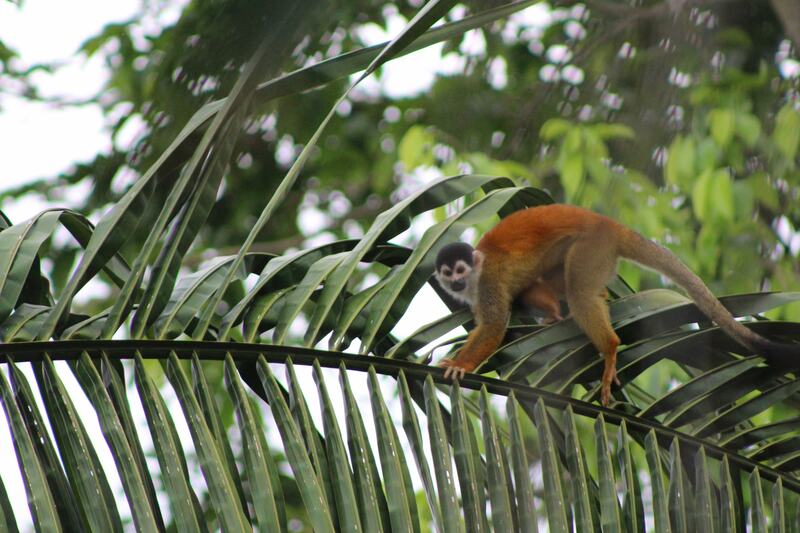 There are a couple of different types of monkeys in Costa Rica, most of them can be found spread out in the country. Though, Osa Peninsula is one of the few areas where you can actually see the four species at the same place. The monkeys you can find here are the squirrel monkey, the spider monkey, the white-faced capuchin and the howler monkey. These are somehow small monkeys who usually travel in packs. They use their tails as an equipment, to hang by the trees or even swing from branch to branch. The most common of these monkeys are the white-faced and the howler monkey. Both of them are found throughout Costa Rica as long as there is some forest vegetation. So if you hear a loud monkey scream in the forest, it’s probably the Howler monkey. Their scream can be heard from one kilometer away or even more. 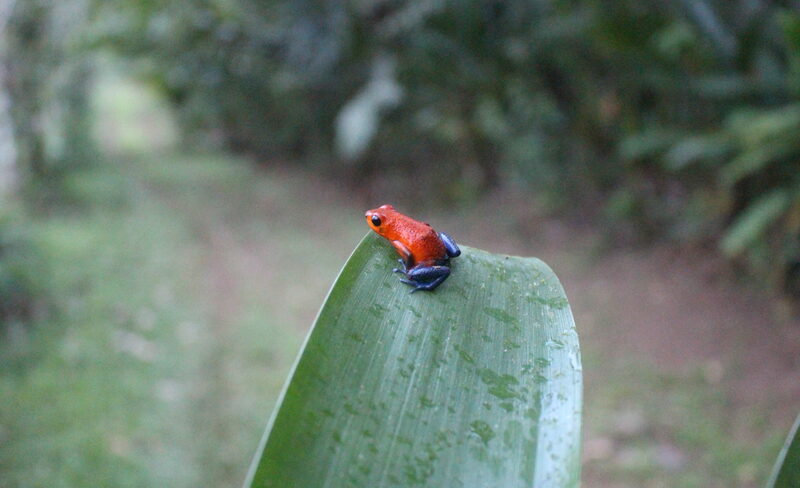 You will stumble upon a lot of different amphibiens when you travel across Costa Rica, one in particular is the Strawberry poison dart frog. This little frog is not more than an inch long and is bright red and has blue legs (reason why some call it also the blue-jeans frog). But the frog can also morph into 15-20 other colors. This makes it a very interesting frog to see in your trip to Costa Rica. The reason for its colors is to show that the frog is poisonous to other predators. The indigenous people used the poison from the frog on their arrows when they hunted. The coasts of Costa Rica are well known for its Sea turtles. There are different types of turtles depending on where you go in the country and they have different nesting times. You’ve got five main species around Costa Rica which are: The green sea turtle, the leatherback, the Olive Ridley, the Hawksbill and the Loggerhead sea turtle. The one that’s most seen throughout the country, and the world, is the Olive Ridley sea turtle which is the smallest of them. 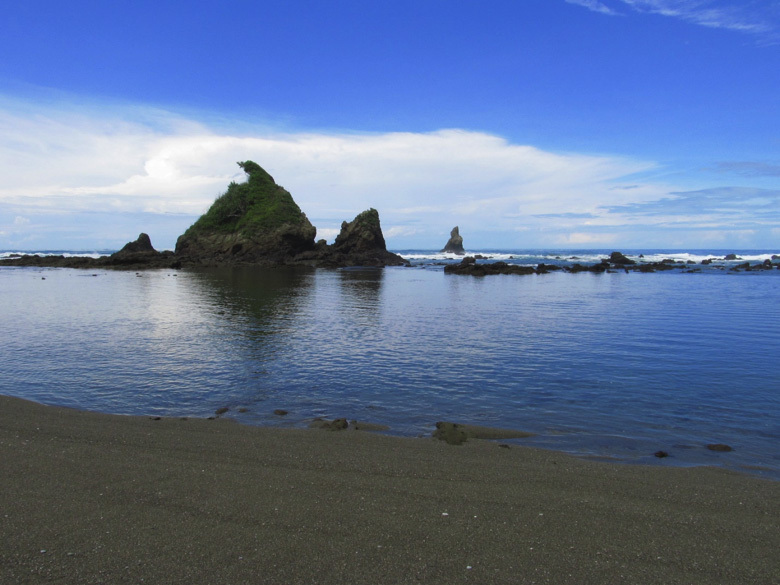 Some places are of course better to go watch turtles than others, places like Tortuguero for the Green sea turtle; or some beaches of Guanacaste like Ostional for the Olive Ridley sea turtle. The wildlife in Costa Rica is something completely different from what you will see in countries in Scandinavia, Europe or North America: you will experience a ton of new things and see both vegetation and animals you’ve never seen before. We, at Elemento Natural, are ready to plan the trip of your life, just come and visit Costa Rica with us.